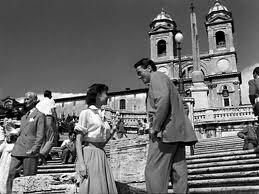 William Wyler’s Roman Holiday stars the great Gregory Peck as Joe Bradley and The Belgian Beauty, Audrey Hepburn as Princess Ann. Peck won the Academy Award for Best Actor in 1963 at the 35th Academy Awards for his brilliant portrayal of Atticus Finch in To Kill a Mockingbird. Audrey – probably best known for her Academy Award nominated performance as Holly Golightly in Breakfast at Tiffany’s, which we presented & I introduced here at Rave on May 7 – received the Best Actress Oscar for today’s movie in 1954 at the 26th Academy Awards. 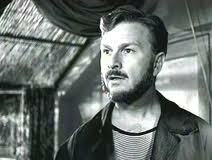 Both stars were also Jean Hersholt Humanitarian Academy Award winners. And their on screen chemistry is incredible. Roman Holiday is a romantic comedy about the princess of an unnamed country on a diplomatic tour of Europe. She hates it. She is young & wants to enjoy her life, but every detail of it is scheduled for her. The stress begins to wear on her in Rome, her last stop, and she breaks down in tears. To relax her, her doctor gives her an injection of a new sleep medication. Amongst its other effects, it gives Ann the nerve to escape her royal reins for a night on the town. Very late that night, American journalist Joe Bradley happens upon & awakens her from a nap at the Forum. At first he thinks she’s just a silly drunk, but soon realizes from her outfit & demeanor that there’s more to her than meets the eye. He hails a cab & agrees to share it with Ann to get her home safely, but she claims to live in the Colosseum. And so her Roman Holiday begins. Many other historic sites are shown in the film: The Spanish Steps, Trevi Fountain, The Pantheon, and The Mouth of Truth. 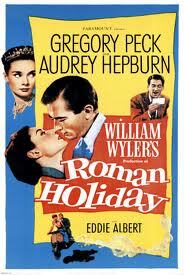 Roman Holiday was nominated for 9 more Academy Awards, including Best Picture and Director (both to 3-time Oscar Winner Wyler, who produced the film also), Adapted Screenplay (Ian McLellan Hunter & John Dighton), and Supporting Actor (for a fabulous performance by a bearded Eddie Albert). 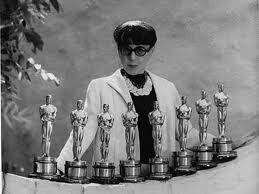 It took the Oscar for Best Story (Dalton Trumbo’s first of two) and Black-and-White Costume Design (the fifth of an amazing eight for the legendary Edith Head). Although the credits read “introducing Audrey Hepburn”, this is not her first movie, just her first Hollywood production. The film’s staying power is witnessed by numerous references in pop culture, many revolving around the Mouth of Truth scene. Tributes to the film are common in East Asia, particularly Japan. 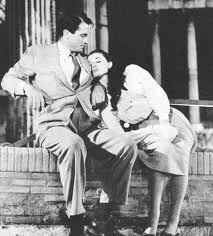 The themes of the film – societal pressure, class segregation, the grass is always greener, the relative insignificance of money, maintaining confidences, and most importantly love found & lost – are as timeless & unforgettable as a mysterious Roman Holiday together. So go to your favorite video store, rent a copy, crack open a nice bottle of red wine & watch it with your significant other. E Salute! Una sera romantica nella Città Eterna!! Vincente Minnelli’s wonderful musical Meet Me in St. Louis is the tale of the Smiths, an affluent, happy family living in greater St. Louis in 1903. 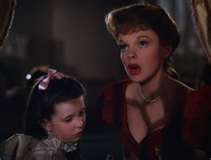 It stars Judy Garland as Esther Smith in one of her many fantastic roles. The brilliant but troubled singer & actress is, of course, best known as Dorothy in the Wizard of Oz. She never won a performance Oscar, but did win the Juvenile Award in 1940 at the 12th Academy Awards for her roles in that film & for starring alongside Mickey Rooney in Babes in Arms that year. Her two Oscar Nominations were for Best Actress for the first remake of A Star Is Born in 1954 (we showed the original here on June 11), and Judgment at Nuremberg in ’61. Ms. Garland died of an overdose of barbiturates in 1969 at the far too young age of 47. 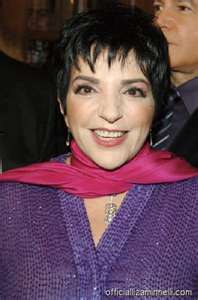 As many of you know, her daughter was Oscar Winner Liza Minnelli. Liza’s father was Vincente Minnelli, who directed Meet Me in St. Louis. The couple met on the set of the film, married shortly thereafter, and divorced 6 years later. Vincente won the Best Director Academy Award for Gigi in ‘59 and was nominated in ’52 for An American in Paris. Quite a talented family, wouldn’t you say? 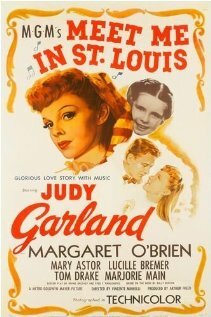 Though it received no Oscars, Meet Me in St. Louis was nominated for 4 at the 17th Academy Awards in 1945: Adapted Screenplay, Color Cinematography, [The Trolley] Song, and Score for a Musical. Other wonderful songs in the film include the title piece, a great arrangement of Skip to My Lou, and Judy’s legendary performance of Have Yourself a Merry Little Christmas. Minnelli’s frames her like the subject of a beloved portrait in that song & throughout film. Margaret O’Brien, great as 5 year old Tootie Smith, won the 1945 Juvenile Academy Award for her supporting roles in this movie & The Canterville Ghost, and for starring in Music for Millions. Amongst the many other fine performances in Meet Me in St. Louis are Oscar Winner Mary Astor as Mrs. Smith; Oscar Nominee Marjorie Main as Maid Katie; Harry Davenport as Grandpa; and Tom Drake as Esther’s love interest, John Truett. Meet me in St. Louis is a story about love – romantic love, love of life, love of family, and especially love for your hometown. The Smiths love living together in St. Louis. It’s home. They’re all so excited that the 1904 World’s Fair is coming to town the next year, they never want to leave. And as long as their stern but loving father, played by Leon James, keeps his great job there, they won’t have to! Like Dorothy said one state away around the same era, “There’s no place like home”. And Meet Me in St. Louis epitomizes that sentiment.